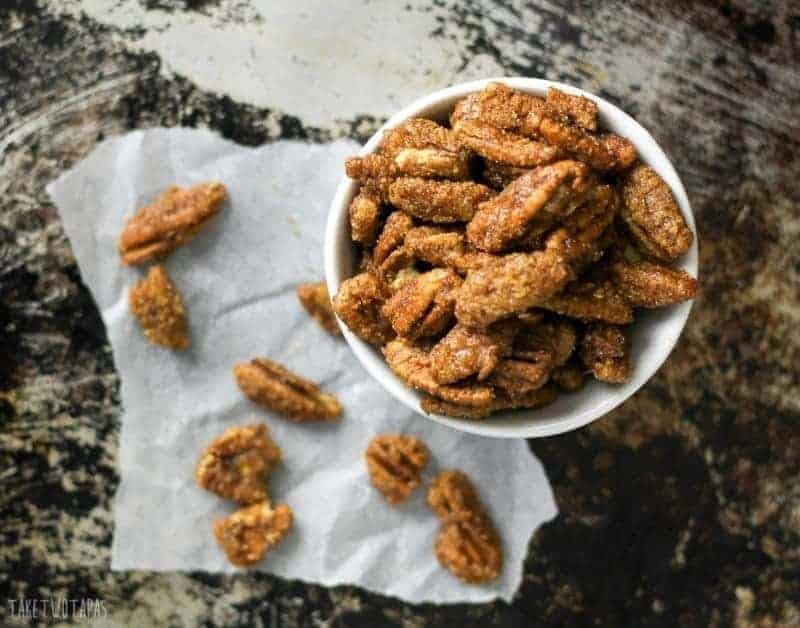 These toasted gingersnap pecans are covered with a sweet and crispy coating that is bursting with the flavors of gingerbread. Cinnamon, cloves, ginger, and a hint of molasses! Perfect for your next holiday party! The smell of molasses and spices always makes me think of gingerbread and my husband’s love of gingersnap cookies. I know most people think of gingerbread for Christmas, but they start putting out Christmas decorations in July, so I can think of gingerbread for Thanksgiving. I guess seeing them take down school supplies and putting out candy starts the “official holiday season” for me. The blasted cinnamon brooms that start arriving way too early seems to start the season for everyone else. I know that I have ranted quite a bit about these ridiculous brooms but I really can’t stand them. They are a serious pet peeve of mine. Much like those people that hang the toilet paper roll wrong, or won’t pull up in the carpool line. That went off tangent quickly, didn’t it? Let’s get back to ginger snaps! Just take me to the GINGERSNAP PECANS Recipe Already! If you’d rather skip my (very helpful, I think) tips and tricks, essential cooking info, and similar recipe ideas – and get straight to this delicious easy GINGERSNAP PECANS recipe – simply scroll to the bottom of the page where you can find the printable recipe card. It’s no secret that I have not been a huge cinnamon fan in the past or ginger for that matter, but my taste buds…they are a-changin’. I recently made some Bourbon Gingerbread Truffles that my friend Dini, over at The Flavor Bender made, and I gobbled them up. Brooks looked at me like I had sprouted a third eye. He couldn’t believe that I liked them! But in my defense, they were filled with bourbon and covered in chocolate. I thought I might give gingerbread another shot after the truffles but in a totally different way. Fall is in the air and with Thanksgiving rapidly approaching, (please slow down, I have so much to get done) I wanted to make a batch of my Ma’s Spiced Pecans. This is a great way to usher some gingerbread in the season, but without actually making cookies or houses. 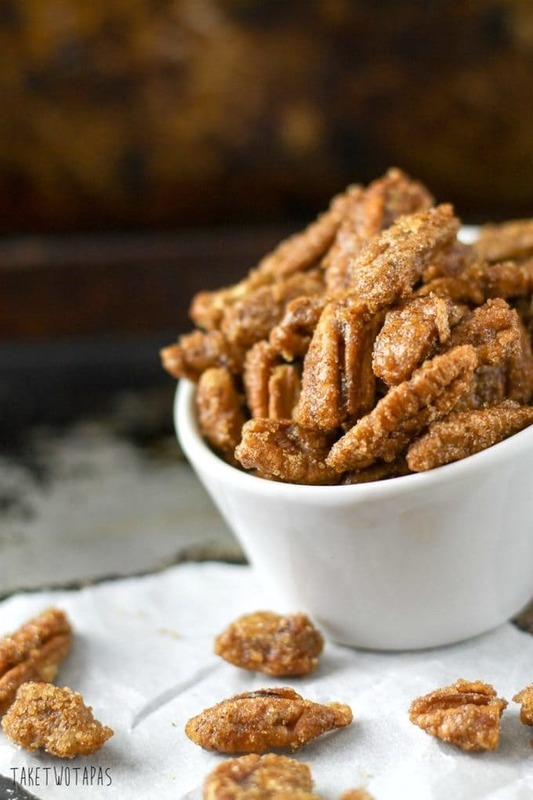 These gingersnap pecans are perfect! They remind me of her and I need to feel close to her as it calms me down. Or maybe a glass of scotch with her will do the same thing:) I made some Fall Spiced Nuts yesterday and thought this might be a great way to usher some gingerbread in the season, but without actually making cookies or houses. 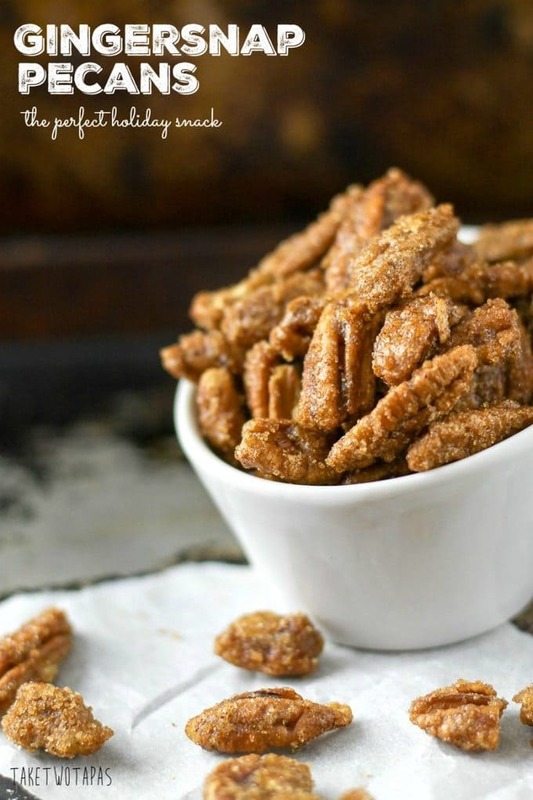 These gingersnap pecans are perfect! I took all the flavors of gingerbread: the brown sugar, the ginger, the cloves, and the cinnamon. I added a dash of molasses for color and that signature flavor and some sugar for sweetness. Tossed my pecans with the delicious mix and baked them in the oven. You can make these Paleo-friendly by substituting coconut or palm sugar for the brown sugar. What came out of the oven was gingerbread heaven. 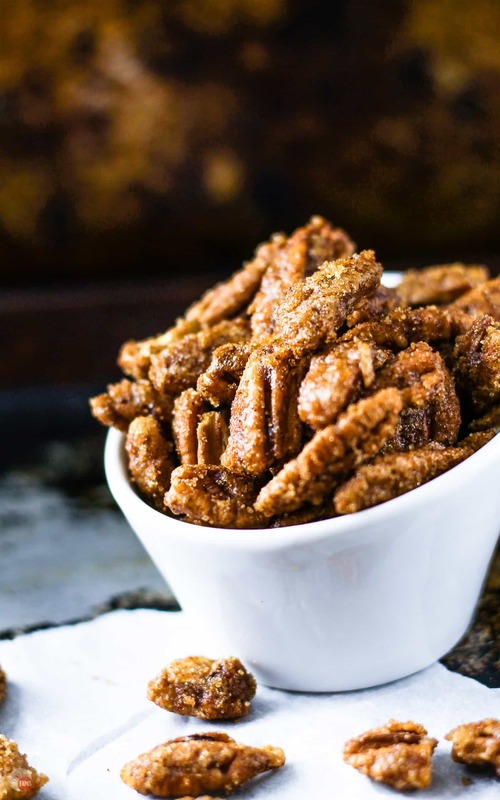 Toasted pecans covered in a sweet and crispy coating and bursting with the flavors of gingerbread. 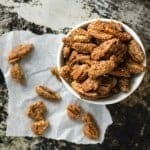 These toasted gingersnap pecans are slightly healthier than the cookies and a total bonus that they are gluten-free!! Make a batch of these and take to your next holiday party! Q: Do ginger snaps help with nausea? A: Ginger is a home remedy for an upset stomach, so some find relief from an upset stomach after eating them. But this is not the opinion of a medical professional. Q: Why are ginger snaps spicy? A: The addition of real ginger envokes a “spicy” taste. Q: Why are they called ginger snaps? A: Because they are a variation on gingerbread and the original cookies were very crispy. Q: Do ginger snaps have ginger in them? A: Don’t make me smack you. Yes, they do! Other great ginger snap recipes to try! Looking for other sweet and spicy nuts to take to a party you’ve been invited to? Check out all my nut recipes, both sweet and savory, to fit your special occasion! If you love this Easy Gingersnap Pecans Recipe as much as I do, please write a five-star review, and be sure to help me share on Facebook and Pinterest! These toasted pecans are covered with a sweet and crispy coating that is bursting with the flavors of gingerbread. Cinnamon, cloves, ginger, and a hint of molasses! Perfect for your next holiday party! Place a silicone baking sheet or a layer of foil on a baking pan. Be sure to spray the foil with non-stick spray. The silicone baking sheet needs no prep. Combine all the ingredients, except the pecans in a mixing bowl. Stir to make sure all ingredients are fully incorporated. Toss in your pecans and mix to coat the nuts. This is a messy step! Place your coated pecans in a single layer on the prepared baking sheet. Bake in the oven for 1 hour at 200F, stirring every 20 minutes. Remove from the oven when finished and cool. Did you mean two cups instead of two pounds. There was too much pecans for the ratio of sugar and spices. I only used two cups and it came out perfect. I’m so glad Christmas is just around the corner but I could eat these year round! These sound so addicting! I can’t wait to make them for the holidays! 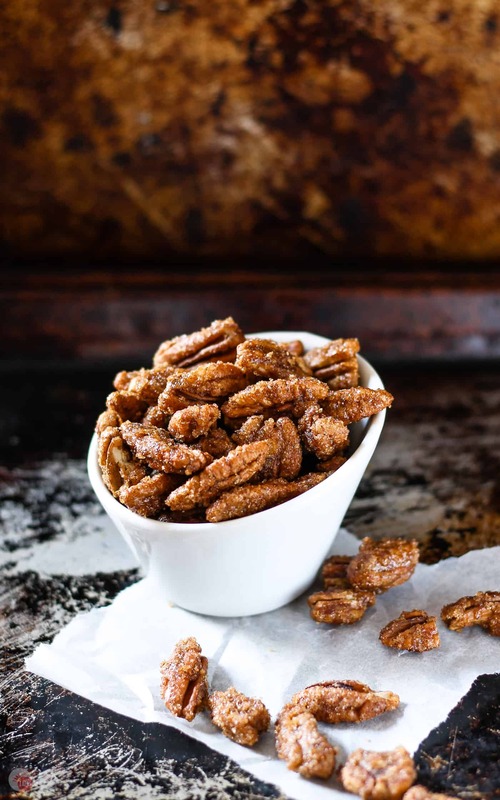 These gingersnap pecans look amazing! I’m already a fan of your Fall Spiced Nuts, so I know these are going to be just as delicious. Great hostess gift idea for the holiday season too! These look absolutely amazing! They would make a fantastic gift for teacher or coworkers. A must make for sure!! My heart did a little pitter patter when you said “Gingersnap!” These are going on my hostess gift list this fall — and I can guarantee you they will be on my charcuterie board at Thanksgiving! These pecans have such a great flavor combination! They’ll be great for fall entertaining! I love this combination of spices you’ve used. This sounds amazing. And, I find that pecans are so good with gingerbread flavors! Much easier way to line the pan used; Reynolds Nonstick foil. It came on the market about 15 years ago, and I’ve never used regular foil for baking since. Doesn’t need the mess of grease or oil of any kind, and nothing sticks to it. I like it too but I rarely buy it because of the price and I have the silicone mats that I can wash and reuse. Thanks for reading! MMMmmm, those look delish!! I’m saving this recipe for later!! 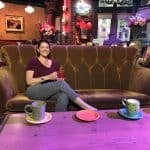 Thanks for sharing and linking up at Manic Monday over at Newman’s Corner! Thanks Stephanie for a great party! these look like such a delicious snack! hilarious about the gingerbread houses lol. that’s so true. Thanks so much! Gingerbread flavor and no cardboard! Thanks Caroline! I love keeping these in the kids snack cabinet too so they will eat more nuts! I need to bring these to my next party! Pinned for later! Thanks Analida! I hope your party host likes them! I love nuts (especially pecans) and I have never thought of this combinations of flavors. Def. making this one this holiday. I love gingersnaps. I love pecans. Put them together=s perfect. Right?!?! Love combining cookie flavors for the nuts so I won’t eat the cookies! These look so good! What a perfect holiday treat…I wish I had some to snack on right now! Going to have to try making them! Thanks Michelle! I had to quit making them for a while because they were all I was eating! I am making some for my kid’s teachers for gifts so I can mak all of them and get rid of all of them! Yum, yum, yum – what a perfect bite! Thanks for sharing with us at #TryaBiteTuesday – tweeted & pinned to pass the word. Stop by again this week if you can – always enjoy your share! Thanks Debra! Love the party! I make a candied pecan but these look and sound amazing! I think I’m going to have to whip them up for thanksgiving~ Thanks so much for sharing this on Throwback Thursday and have a great Holiday Season! This looks fantastic for the holidays and for adding to granola! I am thinking of substituting maple syrup for the molasses so I will see how that goes! I have made it with maple syrup and coconut sugar and it works great! I love the idea of adding to granola! Um, do I have to share? I’d make them and hoard them. I have a problem with that so I make two batches at a time! 1 1/2 for me and 1/2 to share! These look DELISH! I love gingersnap flavor. So nice for the holidays! Thanks so much! I was never a big fan of ginger or gingersnaps either but I am totally hooked now! Seriously, anything with molasses and pecans and I am ALL IN. These look like the perfect snack to me! Thanks Trish! I am so glad that I have a snack to make and give out as gifts! I can get pecans pretty cheap here in South Georigia! C) You are so smart to use your silicone baking sheet. I never think of that for nuts! I never used to use mine but now I am using all the time. Cheaper than all that parchment paper! Make both! I was thinking of trying almonds too! Those truffles are on another level! I LOOOOOOOOOOOVE candied nuts and these look super amazing! I am making them as soon as possible! Thanks Carlee! I know that these are going to be a great gift to give to all my kid’s teachers! Mm, I love this kind of coated pecan, and the spice mix is so intriguing! Perfect for winter! Thanks Katie! I love the spice mix too. I was thinking of trying it on almonds as well! Better than candy….these pecans would disappear in no time in my house. Delish! These, to me, are better than candy too! I love the little hint of sweetness but still feel good about eating healthy nuts! Thanks for reading! I would devour a bowl of these! So yummy! Thanks Rebecca! I needed a new gluten free snack! This is definitely going to be a great party hit, not to mention a great Tuesday, Wednesday or Thursday snack! I have resigned myself to days that end in Y! Thanks for reading Kelly! Thanks for stopping by! I love pecans too and here in GA we can get them cheap! Great snack!